Before I sat down to bang out this DVD review of rock movie The Runaways, I was bouncing back and forth between Spielberg’s War of the Worlds on TBS (with commercials — a real pain) and David Fincher’s Panic Room on Thriller Max, co-starring Dakota Fanning (The Secret Life of Bees) and Kristen Stewart (Twilight: Eclipse), respectively. 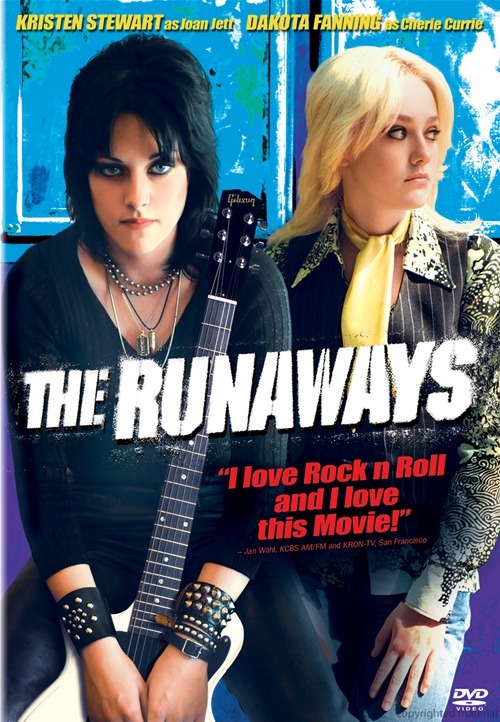 Coming-of-age rock ’n’ roll biography drama The Runaways, about the seminal 1970s all-girl teenage band formed by Joan Jett (Stewart) and featuring singer Cherie Currie (Fanning), is a rather straight-forward affair. Written and directed by music video veteran director Floria Sigismondi and based on Currie’s book , the story of the gals’ meteoric four-year career is filled with all the ingredients we’ve come to expect in rock cinema: drugs, fandom, sexual experimentation, the Richards/Jaggers-esque relationship between guitarist and singer, rock music as an antidote to loneliness, sadness and rejection, and so on. Not that the story and the unlikely relationship between the determined Jett and the glittery Currie isn’t well-told — it’s just not as revelatory or ground-breaking as it was in the days before VH1’s Behind the Music. Barely there co-stars Scout Taylor-Compton (Love Ranch) as Lita Ford, Stella Maaeve (Transamerica) as drummer Sandy West and Alia Shawkat (Cedar Rapids) as a fictionalized bassist named Robin (original Runaways bass player Jackie Fox refused to give the rights to have herself portrayed in the film) are all fine when they’re on screen. 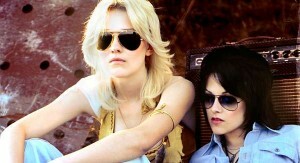 But the film is essentially the Kristen and Dakota show when it comes to the depiction of the band. The exception comes in the form of Michael Shannon (The Missing Person), who portrays the group’s impresario/producer Kim Fowley. A P.T. Barnum-like presence in 1970s rock who was associated with everyone from Helen Reddy to Kiss, Fowley was known to be a slippery, sleazy and seductive character all at once, and Shannon nails it perfectly. These girls really rocked@ Bravo!! How come there as no Lita Ford?